BOOKS & DAUGHTERS WHO READ THEM! Good reminder of another thing to love! Happy Love Thursday! I love you, too, Mom! the times spent reading together are very special and now I enjoy the excitement i hear in her voice when she reads a good book and is anxious for me to send her a new one. T just got through reading "My Sisters Keeper"
I have heard so many people reading/talking about the twilight book, is it good? i don't like scary books though. 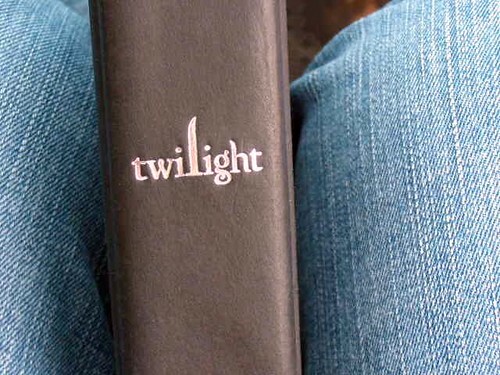 My daughter wants to read the twilight books...i have heard they are about vampires so I think I will have to do a pre-read and check them out first! I really need to pick up a new book.....I haven't read anything in a while! I love to read but rarely do it. Now I have been making time for it. It is funny how it refreshes you. Don't you just love to see your kids absolutely immersed in a good book? Did you read Twilight? it's a good read! What a blessing! It's wonderful to see a kid soaking up some good reading . . . and ENJOYING it! 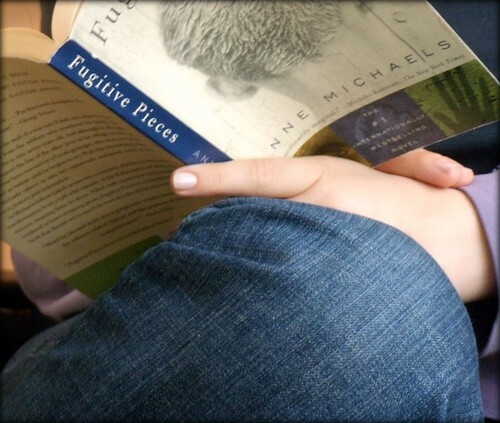 Fugitive Pieces is a great book, isn't it? I see the girls at work reading Twilight, I'll have to borrow a copy when one of them is done! The enjoyment of reading is such a wonderful thing to share with your children. You've made the ordinary beautiful in your photos! My co-worker has been going on and on about the Twilight book(s?) and she is so excited about the movie. Reading is so important when our kids are younger and I read to both of my boys all the time when they were young. The oldest has always loved to read and the youngest never did like it. They are both adults now and the same thing still holds true. They just turned out so differently. Great photos!! being a mom appears to have a tender, dreamy element to it. i look forward to the time when i will know this priviledge. the perfect banner for your site. There is nothing like sharing a book. Every day I curl up on the couch in my classroom. There are at least three squirmy seven year olds beside me, four leaning over my shoulders, and 10 or so at my feet. Such a lovely squish. Even better, every night at home. One sofa, on cat, one little girl, one perfect man. Awww... this is beautiful. I love reading with my daughter. Thank you, for sharing this.